Hiking can be good for the mind, body, and soul, but it can be equally as trying if you don’t adequately prepare for it. While a simple short hike at a nearby park or reserve may not require as much planning as a long day or multi-day trek, there are still some things you should be aware of before setting out. Those new to hiking may not be wise to the hidden dangers that they can be presented with. Whether you are planning to take up hiking as part of your fitness regime or simply want to enjoy getting out in nature, here are five of the most common hiking dangers and mishaps and how you can prevent or treat them. Mother Nature has been known to bite back, especially when it comes to our little insect friends. Whether it’s mosquitoes, flies, or bees, insects can inflict some uncomfortable and often serious bites and stings. There are many repellents that can be bought from any outdoor store, and these are one way to keep things like mosquitoes at bay. Sprays or creams with a high DEET content are usually most effective. If you happen to be highly allergic to bees or certain types of ants like jack jumpers, packing an EpiPen is a really good idea. The first line of defense should be covering up your skin so as to provide a thick enough barrier that bugs can’t reach your skin. This means long sleeves and pants and possibly even a pair of gaiters to help stop ticks and prevent serious bites from other critters like venomous snakes. If you do find yourself getting an insect bite, natural products such as Calamine Lotion can help to rid you of the annoying itch. Before setting out on a hike, familiarize yourself with what potential insects are in the area and whether they are more prevalent certain times of the year. It is important to note that even friendly looking insects like caterpillars can inflict some serious stings. Cramping often occurs because of dehydration, therefore drinking enough water is essential to avoid muscle cramps. Always pack more water than you think you’ll need, as you may not realize how much water your body needs when you overexert yourself. If undertaking a longer multi-day hike where you won’t be able to carry the amount of water you’ll need, make sure there will be fresh water sources along the way and think about bringing a water treatment device or tablets. Avoid drinking alcohol while hiking as this can simply dehydrate you more. Ensure you stretch before your hike to warm up your muscles and if you do find yourself with cramp whilst hiking, know that you can usually treat muscle cramps with self-care measures. You can often stretch or massage a muscle cramp out and applying heat often helps as well. Those small hand warmers you can activate on demand work nicely. Our beloved sun presents a range of dangers for us. From sunburns to heatstroke, the sun can ruin a day hiking really quick. Regardless of whether you’re hiking during the summer or winter and whether it’s cloudy when you set out, always slap on some high rated SPF sunscreen. You can still get sunburn in the colder winter months, especially if there is a lot of snow to reflect the sun’s rays. Not that the higher you are in altitude, the easier it is to get sunburn as well. During the summer, keep in mind that you are more prone to sunburn if you’re on or near the water as well as lounging or playing on the sand. Be sure to reapply sunscreen every few hours and select a more water resistant brand if planning to swim. Bring along a hat, quality pair of sunglasses to protect your eyes, and lip balm to prevent your lips from burning and cracking. If you do manage to get a bit red, apply Aloe Vera afterwards and avoid the sun or cover up for the next few days. Keeping our feet in tiptop shape is vital when it comes to hiking. Blisters can quickly make hikes short lived. Blisters are caused from friction, whereby fluid builds up between layers of our skin. If left untreated, they can swell, cause extreme discomfort, and even burst. The best way to avoid blisters is to ensure that you have a pair of hiking boots that fit you well and pair them with a quality pair of thick socks. Find the best hiking shoes you can afford and break them in well before you plan on undertaking longer hikes. If certain parts of your feet like individual toes or your heels are more prone to blisters, you can also tape these areas or apply a Band-Aid under your socks. Minor scrapes and abrasions are quite common occurrences when hiking, it is therefore a great idea to carry a small First-Aid kit with you. This will allow you to easily clean and cover any cuts, thereby preventing possible infection. Even small cuts can lead to more serious issues if not treated quickly or effectively. Carrying pressure immobilization bandages or compression bandages is also a good idea and can be used for things like snake bites and sprains. 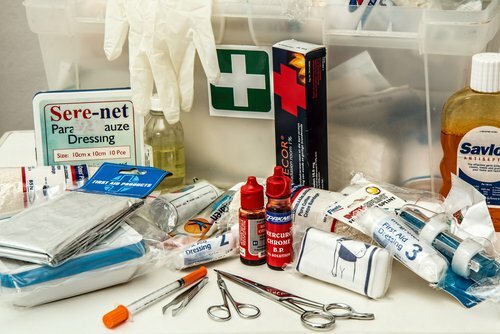 Your kit should include antiseptic cream and saline solution for cleaning wounds and eye wash is a good idea should you get anything in your eyes. A small packet of salt can help remove leeches. Although hiking does have its dangers, many can be easily avoided with a little preparation. Obviously hiking in more remote areas will require more thorough planning, but any hike large or small can easily be enjoyed by nearly everyone and is a great way to get back to nature while also getting a bit of exercise in the process.